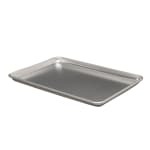 The Vollrath 5303, formerly the Vollrath 68371, is a half-size sheet pan made of durable 18-gauge aluminum. The aluminum is part of the 3000-series, making it impact-resistant. The rims are closed-bead with built-in rods for reinforcement to prevent warping. The 1-inch-high sides help contain food, particularly any liquids that gather as food cooks. These sides are also tapered, making these pans able to be stacked for easy storage. "If as good as the cookie sheets, should be great." "The 5303 is possibly THE all time best purchase ever made for my kitchen. I bought four of these between 1979 and 1981. I am still using them e..."
"The 5303 is possibly THE all time best purchase ever made for my kitchen. I bought four of these between 1979 and 1981. I am still using them everyday for cookie sheets (with parchment), baking sheets for roasting vegetables (with parchment), underpan for anything that goes in my oven (and rarely need to clean oven at all), cleanable "surface" for any messy job in the kitchen (like taking a whole turkey out and "resting" it on something). A few years back an acquaintance who was a professional chef told me that NOTHING went in his home oven without being on a half sheet pan.) I used to carefully clean them after each use, back when having spent $14-16 apiece in the late '70s was a LOT. By now they have some modest accumulated stains but, honestly, that is why I pull them out instead of my four still-pristine 5314 (the 13 gauge ones Cooks' Illustrated ranked #1 a few years back) because they work just as well and I don't have to worry about staining them! (That said, if I were buying them for the first time and when I could easily afford the extra $, knowing that I was going to keep and use them for that long, I might get the 5314.) Four of these, at this fantastic price, form the relatively inexpensive core of my commonly-given shower or housewarming or thank-you gift and, depending on how much more you might want to spend (or not)can anchor a box of "favorite things" that an "older" baker/cook has identified over the years and hopes a newer cook will come to look back on with the same appreciation. If you are going to use them this hard and this long, you don't need or want to invest in some type of non-stick coating (in my estimation)."